Ecommerce vs Web Content Management: Which Should Power Your Digital Experience? Home Ecommerce Platform Ecommerce vs Web Content Management: Which Should Power Your Digital Experience? According to Forrester Research, ebusiness and channel professionals’ top investment priorities this year include the ecommerce platform and Web Content Management (WCM), as many ecommerce sites, CPG brands and manufacturers selling direct to business and consumers seek to replace existing systems with best-of-breed tools to deliver the ultimate digital customer experience whilst freeing marketing and merchandising teams from reliance on IT. 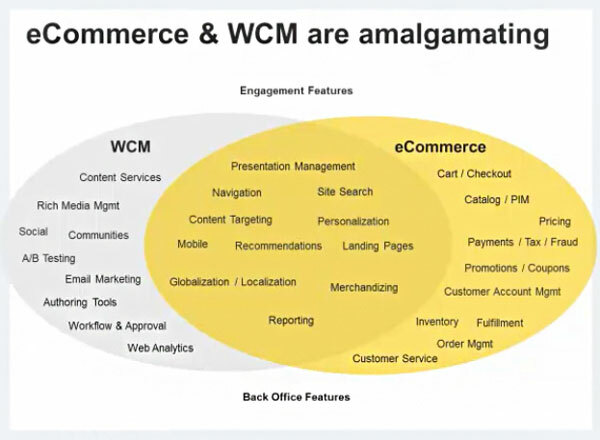 Over the years, both ecommerce and web content management vendors have been investing in “engagement features,” and there is a significant overlap between capabilities. Both can control navigation, search, presentation layer, merchandising, recommendations, support mobile, etc. But they each bring unique capabilities to the table as well. When you think about next-generation digital experience platform, it goes beyond just the platforms themselves. Controlling the on-site experience requires many different solutions and systems, from A/B testing and analytics to social platforms, recommendation engines, bid management and loyalty platforms. It’s not uncommon to have over 20 different integrated solutions involved in delivering that online customer experience. Some are very complex, some are front-end, some are back-end, but every next-generation digital experience requires this integration. Organizations looking to build best of breed solutions find strengths and weaknesses in each system. 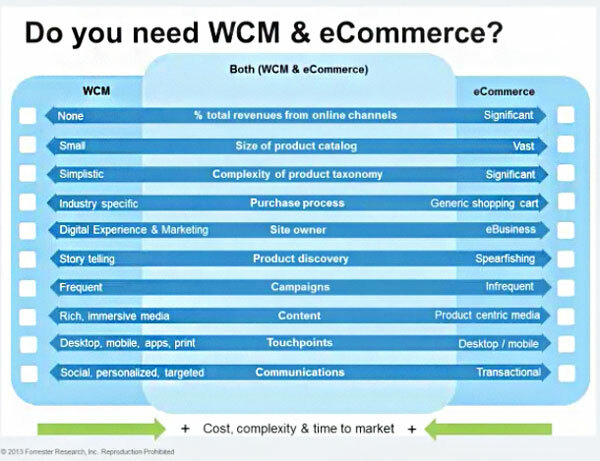 A common inquiry that Principal Analyst Peter Sheldon receives from Forrester clients regards whether to invest in WCM, ecommerce or both — and which platform should drive which piece of the experience. Similar to a build vs. buy decision when considering an ecommerce platform or replatform project, determining whether to run your digital commerce experience through WCM, ecommerce or both requires an understanding of your business’ characteristics and needs. It’s not uncommon to find you select multiple tickboxes for both ecommerce and WCM — you may be inclined to lean to a hybrid solution that combines a little of each system. But keep in mind running both carries a higher cost, complexity and time to market. You may look at a lighter weight solution of one system (like open-source) if you only have a few tickboxes checked. What is your online revenue? If you’re a lower volume seller, you may be able to get by with a home-grown platform or run completely through a content management system. If you’re high volume seller with a complex catalog, large number of SKUs or complex buying configuration, an ecommerce platform is important. How do customers purchase what you’re selling? Do you and your competitors use a traditional shopping cart, or like a hotel, airline, or sell complex in-app digital goods for which you require customized purchase flows? Who traditionally “owns” the site? 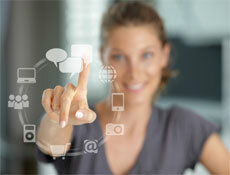 Is it eBusiness, IT, marketing, brand? Do you have separate geographic or mobile teams? How much independence do they need from IT? Who has more influence over platform selection? How do customers discover products and services? Do customers spearfish, or do they require a longer process that involves romancing, digesting content, using guided selling tools? Do you require a storytelling experience? How frequent are your campaigns and what are they? Do you launch new products and upgrades frequently? What types of promotions do you run? Do marketers lean on WCM to run these campaigns? What types of content do you need to support? Is your content structured entirely around your product, or do you have engagement content (video, product configurator, guided selling etc)? Which touchpoints do you need to support? Do you need to deliver beyond mobile, desktop and tablet to include print, support channel partners, microsites, or other parts of your organization with rich media content? Do you need to tap deep into social, email, apps and cross-channel behavior to drive personalization? The easiest and quickest to market approach is to use the platforms as stand-alone platforms, side-by-side. Both are responsible for delivering the HTML to the site, typically WCM handles product discovery and exploration of the site, and the ecommerce platform powers the buy and checkout process. Though they power different pieces of the experience, organizations typically make templates and look and feel to appear seamless, use single sign-on and other tactics so the customer experience appears well-integrated, and the customer is not exposed to the complexities behind the scenes. The second option is for ecommerce to take the lead. In this approach, WCM delivers no pages to the website, rather takes a backseat, simply providing a content repository to store rich media assets, et cetera. The challenge with this approach is that investing in WCM is expensive and can be complex to integrate. Selecting it just to be a content repository is not always the best approach, and it’s one that’s in decline. 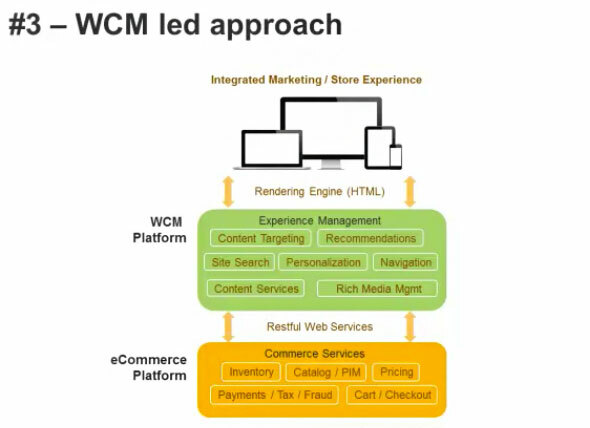 Peter calls this the “utopia approach.” When WCM leads the experience, marketers and merchandisers have control over experience and can make content changes in a dynamic way, such as drag and drop changes without requiring any IT releases. This approach uses the ecommerce platform as system of record, for promotions, catalog, payments, inventory et cetera, and exposes these services through APIs. 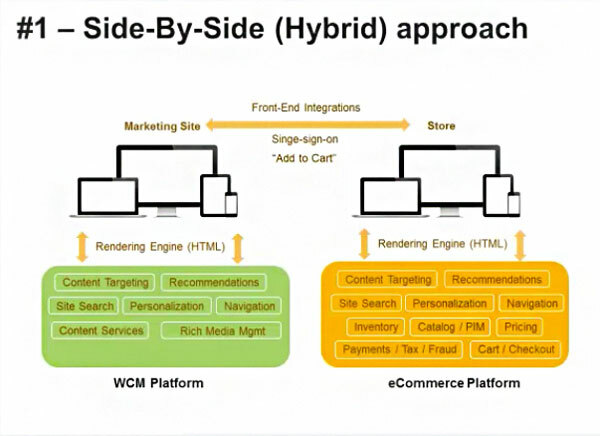 The WCM platform can apply its own recommendation rules and drive a consistent experience. Though complex, it’s becoming increasingly popular. Organizations can soften the blow by rolling this out over time with a multi-phased approach, beginning with a side-by-side solution and slowing passing more features and functionality to web content management until the majority of the site is running through it. 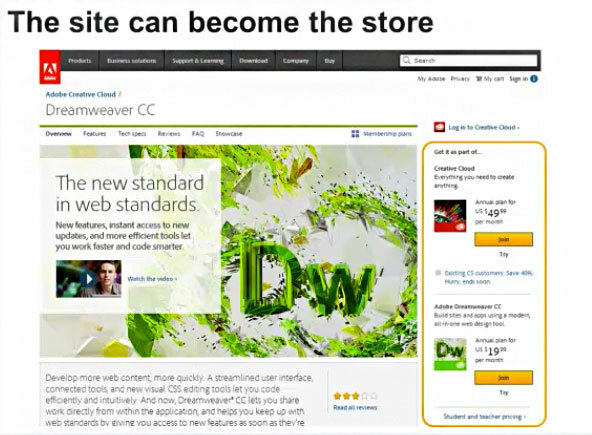 Adobe is a great example of a brand that moved away from a bolt-on ecommerce store to a truly integrated dot-com site. Adobe has achieved a site and store experience that has no differentiation, and no fragmentation of experience between separately managed domains. 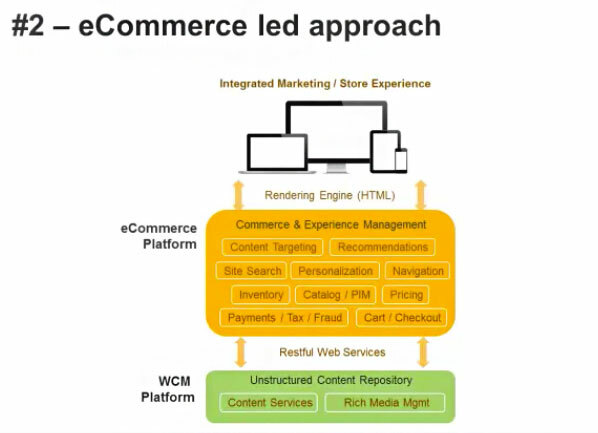 Our webinar with Peter Sheldon covers a range of FAQs about web content management and ecommerce, check it out on demand. Previous articleEcommerce vs Web Content Management: Which Should Power Your Digital Experience?